One of the biggest hurdles to overcome for physician-led accountable care organizations (ACOs) is faulty clinical data. Most ACOs’ population health efforts gather data from disparate member practices. If clinical data is not accurate, physician trust deteriorates. Since many physicians’ first reaction to data is to reject it, ACO leaders should confirm information before presenting it to physician members. At Goshen Health and Family Practice, a 50-physician primary care ACO that covers 100,000 people in Goshen, Ind., the journey from dirty data to clean, reliable information involved building trust, engaging physicians and ensuring ACO viability. 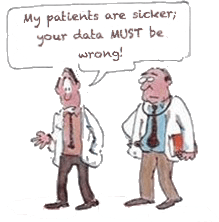 A proven way to address the lack of trust in clinical data is to begin with easy wins. Focus on a quality measurement that provides an opportunity to improve performance and a high level of confidence in the numbers. With certainty achieved on the first measure, ACO leadership is better equipped to present clinical data findings for more complicated measurements, acknowledging up front the complexity and need to verify the scores. Goshen’s ACO leadership performed manual chart reviews to validate the clinical data and determine root causes of disparities in performance around pneumonia vaccine rates. Data was reviewed at the practice, provider and patient levels. The ACO’s data validation review revealed dramatic differences in patterns for giving pneumonia vaccines. Other variations were seen in the administration of depression screening and renal function screening for patients on high-risk medications. Inconsistent clinical data capture. The EHR may not be configured to support the correct data capture, making it difficult for staff to achieve consistency. For example, a data element may not have been captured historically unless it was a problem: “I asked if their meds had changed and they said no, so there is nothing for me to do.” Analytics technology helps identify inconsistencies and can be used to better train providers and staff in correct placement of information within the EHR. Incomplete use or access to EHR clinical data. Data may not be accessible by the ACO. It could be in another system, a different ACO practice or completely outside of the practice, hospital or other location. For example, practitioners should ask patients where they received flu shots and eye exams and what the results were. Capture this type of information in the EHR even if the work wasn’t performed at the ACO practice. Shifting quality thresholds. What is measured can change from year to year, and published guidelines can change. For example, the Centers for Medicare & Medicaid Services (CMS) based a blood pressure guideline on American Medical Association (AMA) recommendations. Then AMA changed the recommendations. Physicians had to either prescribe based on the AMA recommendation or the CMS guideline. Even high-level quality programs are constantly changing and can be complicated and confusing. Deciding what to measure and making progress toward improving those measurements can be frustrating for both ACO leadership and physician practices. Multiple, overlapping EHR systems. Disparate EHR systems create silos of data that are difficult to organize. In these environments, software with the capability to access, aggregate and normalize data is a practical solution. By taking time to validate its clinical data, Goshen strengthened physician collaboration and ACO participation. Now, 95% of Goshen’s physicians have signed contracts to participate in the ACO and its value-based initiatives. Clinical data validation is also a critical step to ensure correct quality reporting under the Medicare Access and CHIP Reauthorization Act of 2015 (MACRA), the Merit-based Incentive Payment System (MIPS) and other value-based reimbursement models. Focus on outliers for clinical data validation. Use compiled ACO data to identify problem areas by practice, physician and population. Review findings with physicians and explore any questionable findings through manual chart reviews to validate clinical data within the physician practice EHR and the ACO data platform. Recognize physicians’ need for answers, not just data. Data analytics technology should be used to inform ACO members which patients need what treatments so they can proactively fix or prevent a healthcare crisis. Practices should also pull data from EHRs and payer claims to combine quality and cost by physician, calculating a cost per member per month. Maintain strong communication and feedback. Goshen conducts quarterly face-to-face collaborative dinner meetings with members to receive feedback, share data and review costs. These events provide a safe environment to deliver timely data, share ideas and explore gaps and dialogue with other specialists. ACO leadership also sends physician members frequent dashboard reports and scorecards. Weekly emails covering a specific topic are another effective communication tool to keep physicians engaged and informed. Know when and where member patients are being seen. For example, it is important to track mammograms by organization, individual physician and targeted patient populations to view referral patterns and prevent leakage. This data should be integrated into a single platform whenever possible. Data reliability has become a key challenge to improving population health and building successful partnerships within physician-led ACOs. If physicians don’t have faith in the data, they will not subscribe to the technology and methodology used to identify at-risk patients. An ACO’s ability to perform clinical data validation — when and where it is indicated — is paramount to securing physician confidence and establishing long-term support for population health programs.